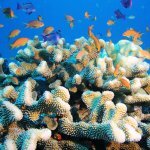 Taveuni is one of the best-known dive locations in the Fiji region and highly regarded as the best place to see soft coral blooms. 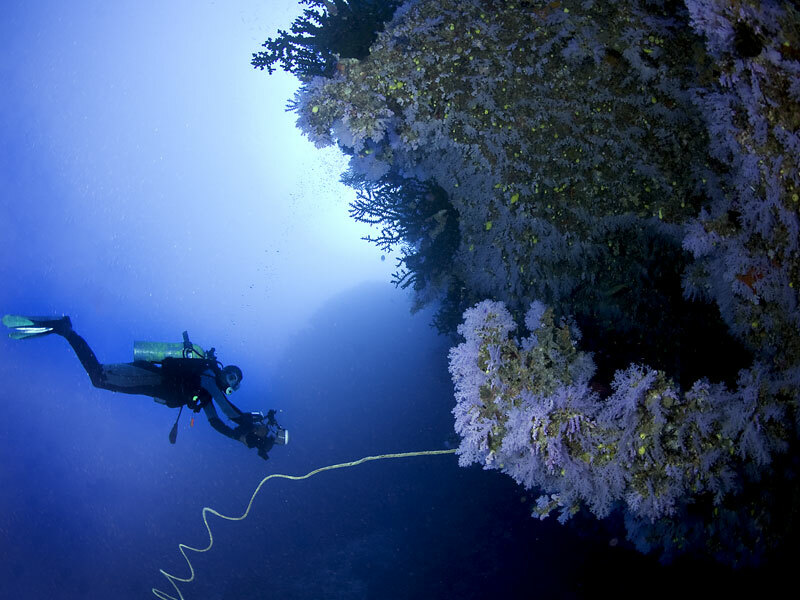 Dive through tunnels, along walls of white, purple and yellow soft corals while enjoying the view of marine life. Expect to see plenty of pelagic fish species, barracudas, octopus, reef sharks and manta rays. It is also the location of the infamous Great White Wall (see Dive Sites). Taveuni has an unspoiled quality that is hard to find in today’s world. The rugged mountains, verdant rainforest, exotic flora & fauna, lakes, plus the surrounding sea with its colourful reefs and multitudes of tropical fish make up an ecosystem of incredible diversity. It’s nickname “Garden Island” applies not only to the landscape, but also to the underwater coral gardens. Taveuni, (pronounced Tah-vee-ew-nee), the Garden Island of Fiji, is a paradise for nature lovers and scuba diving enthusiasts. The rugged mountains, verdant rainforest, exotic flora & fauna, lakes, plus the surrounding sea with its colourful reefs and multitudes of tropical fish make up an ecosystem of incredible diversity. 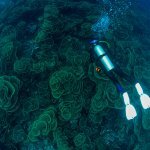 A diver in Taveuni will soon appreciate that its nickname “Garden Island” applies not only to the landscape, but also to the underwater coral gardens. The island lies only seven kilometers off the southeast coast of Vanua Levu. Once the home of fierce warriors, Taveuni residents still exude Beautiful Coastlinepride and confidence in their step. The island of Taveuni is rich in Fijian traditions and culture, and the people some of the most delightful in the world. With a population of around 12,000 inhabitants, Taveuni is sparsely populated, and virtually all islanders live in traditional Fijian villages. Taveuni is wet at the mountain tops and rain forrest, rugged and verdant. It is approximately 42 km long and 11 km wide, and covers 440 sq km and is Fiji’s 4th largest Island. The island is volcanic in origin and comprises volcanic cones forming a 900-metre-high ridge throughout the length of the island. Among the four summits contained in this ridge are two of the highest mountains in Fiji, Mt Bouma WaterfallUluigalau (approximately 1240 metres) located at the southern end of Taveuni and Des Voeux Peak (approximately 1200 metres) located in the centre of the Island. A breathtakingly beautiful island, Taveuni has winding roads which weave through lush tropical forest, past magnificent waterfalls to suddenly reveal a sparkling white beach where yours are the only footprints in the sand. Hundreds of waterfalls crash Tagimaucia Flowerdown around the coastline, their waters so clean it is said that in the days of the sailing ships, they would back up to them to refill their water tanks. One of the world’s rarest flowers, the Tagimaucia is found only on Taveuni, four thousand feet above sea level on the fringes of the lake. The name means ‘crying tears of despair’ and behind it is a legend with twists of love and a happy ending. Taveuni has a unique quality that is hard to find in today’s world; it is unspoiled. Here exists an ecosystem of incredible diversity…rugged mountains, verdant rainforest, exotic flora & fauna, lakes, plus the surrounding sea with its colourful reefs and multitudes of tropical fish. A dramatic site only dived at when the current and tidal changes are right. 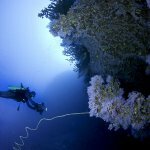 Starting at a depth of about 15m and continuing to over 60m this vertical wall is covered in white soft coral that dramatically plunges into the depths of the ocean. You’ll encounter colourful sponges and crinoids, lionfish and morays as well as soldierfish, squirrelfish and fairy basslets throughout. 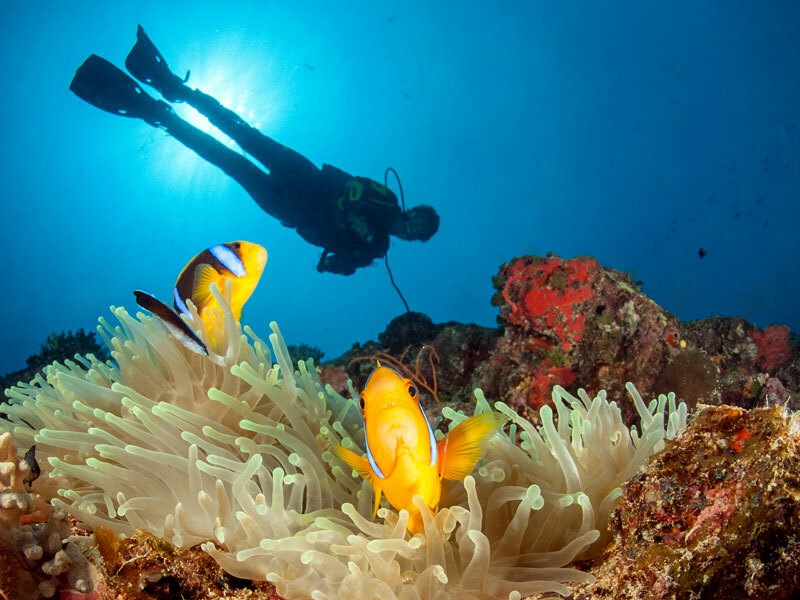 A dive site that Is a continuation of the wonderland known as the Rainbow Reef. Here you can investigate the nooks and crannies, weave in and out of the bommies and keep your eye open for leopard sharks resting on the bottom or blue-spotted rays. This site really comes alive with spectacular bursts of colour when the current is running strong! Located on the same reef as Annie’s Bommie, the Corner is roughly the same distance from shore (15 minutes) and located at the same depth (20m). There is a wonderful variety of multi-coloured soft coral. It’s called “The Corner” because it’s actually a corner of a large reef. 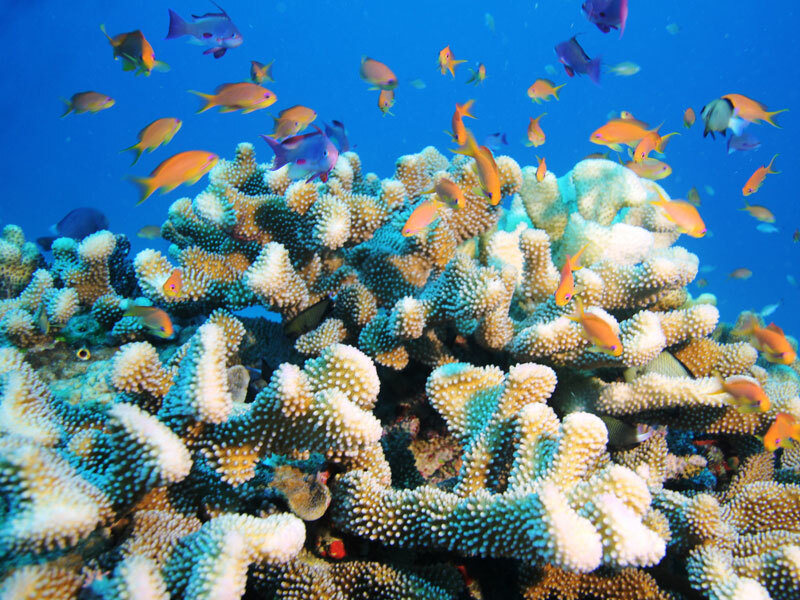 It’s an oasis of soft corals and there is often an unbelievable amount of fish life here. Located only 10 minutes from shore and at a depth of 20m is one of the most popular dives aside from the Great White Wall. It consists of a pinnacle of coral that rises from a depth of 80-90m almost to the surface. It’s a magnet for reef fish and pelagics, with lion fish in residence in the overhangs and crevices. There are also outstanding soft corals here as well as a tremendous variety of underwater flora and fauna that makes for good night diving. Another plus is that it’s easily accessible and great for photos. 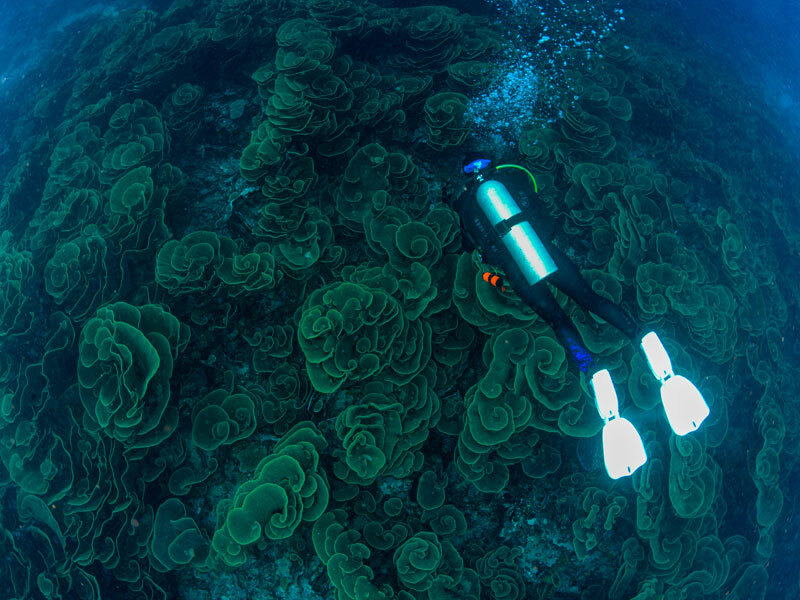 This vast field of cabbage coral stretches well beyond the area of sight. The layer upon layer slopes up from 30 metres to the shallows of 8 metres. Be on the lookout for sea cucumbers, and if you’re lucky you might see the long yellow blenny. Unicornfish, arc-eye hawkfish, achilles tangs and scalefin anthias are all likely marine contenders for your attention here too. 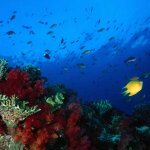 Taveuni’s 30km Rainbow Reef is home to one of the world’s greatest displays of soft coral. Fed by the nutrient-rich waters that flow through the Somosomo Strait, sea life and soft corals are everywhere in technicolour profusion – hence the name. 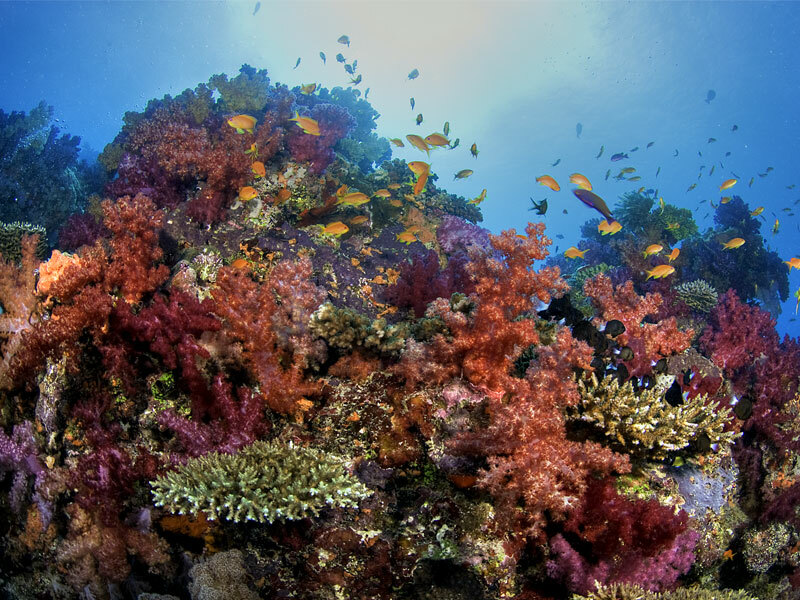 In fact the first thing that strikes you on arrival are the abundance of bright colours on the reef. 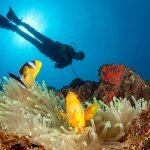 Combine this with other dive sites such as the Great White Wall, Fish Factory, The Zoo, The Pinnacle and other spectacular drop offs, the myriad varieties of fish, warm water, easy accessibility and great visibility, and it’s easy to see why the reef has won such international acclaim. A 30m wall dive where you’ll see pelagics such as barracuda, sharks and tuna. There are also some beautiful gorgonian fans at this site which is about 30 minutes by boat from the resort. This is the most distant dive site you are likely to visit, and is only done on outgoing tides. This dive site has its share of big fish including barracuda, reef sharks, bronze whalers, eagle rays and manta rays. It’s a wall dive with a 30m maximum depth that is only done on outgoing tides. A series of coral heads in every conceivable colour of soft coral. It’s a favourite of photographers because of the colours, the abundant tropical fish life, and the numerous small caverns and crevasses that mark the reef. It’s located 15 minutes away by boat and is at a maximum depth of 20m. This 20-25m dive is done as a drift dive. 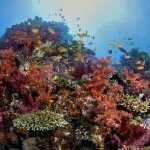 There are some incredible violet soft corals as well as an amazing density and variety of fish. The main attraction is the blue ribbon eel, which measures about the length of a finger, but has strikingly vivid bands of blue and yellow. Despite the colouration these eels are hard to find for novice divers, but your dive guide will easily point them out. Bouma Falls is one of the most beautiful spots in the world. Located in Tavoro National Park, it is a perfect destination for a half- or full-day trip. Bouma Falls actually consists of three waterfalls: the first is an easy ten-minute walk from the main road. The waterfall is approximately 30 meters in height and falls into a large pool where one can go swimming and dive off the rocks. A wonderful trail has been built up to a second waterfall which is a worthwhile trip for the more adventurous. About 60 feet high and perhaps more dramatic, this second waterfall takes about thirty minutes to reach from the first along a well-manicured trail which has steps, handrails and benches for rest stops. The walk to the third and final waterfall – which is only about 8 meters – takes about thirty minutes on a more rugged path. However, the beauty of this waterfall is in the remoteness of the area and the perfect stillness – a wonderful place to meditate! Travel to the far northeast end of Taveuni to Lavena, one of the most picturesque villages on the island. At Lavena village you can see how a traditional village operates, meet some of the villagers and perhaps the Village Chief. Lavena also features one of the most beautiful beaches on Taveuni. This beach, with its spectacular white sand and crystal clear water, was featured in the movie ‘Return of the Blue Lagoon’. It is an ideal spot for swimming, snorkelling, and picnicking. From there take a 5 kilometres graded walking path to the Tobu Vei Tui falls. The walk takes about one and a half hours of which the last thirty minutes is up a creek bed. The falls are spectacular and, if you’re lucky, your Fijian guide will show you how to jump off the face of the cliff into the pool below! It is also possible to take a boat trip to other spectacular falls further down the coast. Lake Tagimoucia is located in an old crater 823 meters high in the mountains. The lake, which is filled with floating masses of vegetation, is just below Des Voeux peak which is the second highest spot on Taveuni at 1,195 metres. The highest peak on the island is Mt Uluigalau which is 1,241 metres high. These are among the highest mountains in Fiji. The hike to the lake is very strenuous and should only be attempted by the serious hiker. It takes about 3 to 4 hours each way. The highlands are also home to Fiji’s most famous flower, the tagimoucia (tahng-ee-mow-thia), a red and white flowered creeper which is linked to a local romantic legend about love lost and love regained. It only grows above 2,000 feet, and usually blooms from end of September to end of December. Any attempt to transplant the flower at a lower altitude has failed. Located at the southern end of the island, played an important role in the settlement of the first Europeans on Taveuni. The original plantations and homes of these white people were within the jurisdiction of Vuna and thus the land was either purchased or bartered from the Tui Vuna, the chief of the area. Some of this land is still owned by the descendants of the original settlers. Beyond Vuna at the very end of the coastal road is a village called Navakawau, which literally means “end of the road”. It is a beautiful – though bouncy! – drive along rugged coastline down to Navakawau. One of the highlights is a tidal ‘blow hole’ which is quite impressive to see if the tide is right. Vuniuto is a beautiful village just a quick ten minute taxi ride from the resort. The grounds have many lovely large green leafed breadfruit trees, a local staple favourite food and quite delicious when ripe. Vuniuto is Fijian and means breadfruit tree. This special guided trip allows you to visit a local homestead, where the villagers will welcome you in experiencing their lifestyle. There will be demonstrations of Fijian crafts – basket making, mat-weaving, coconut husking and uses, fire-making, earth oven (lovo) demonstration, preparation of the traditional drink ‘yaqona’ – more widely known as ‘kava’. Enjoy an afternoon tea session with cakes and a Fijian ‘meke’ or song and dance performance. Korolevu is a small island just off the resort offering excellent snorkelling and beautiful white sand beaches perfect for sunbathing. Dolphins are sometimes seen just offshore. Regular boat taxis from the Dive Center whisk you away to this tropical paradise. Romantic and picturesque, this is the ideal spot for a private picnic lunch. Rainbow Reef’s spectacular underwater gardens are just 20-minute boat ride away. This excellent snorkelling location is quite different from Korolevu Island. 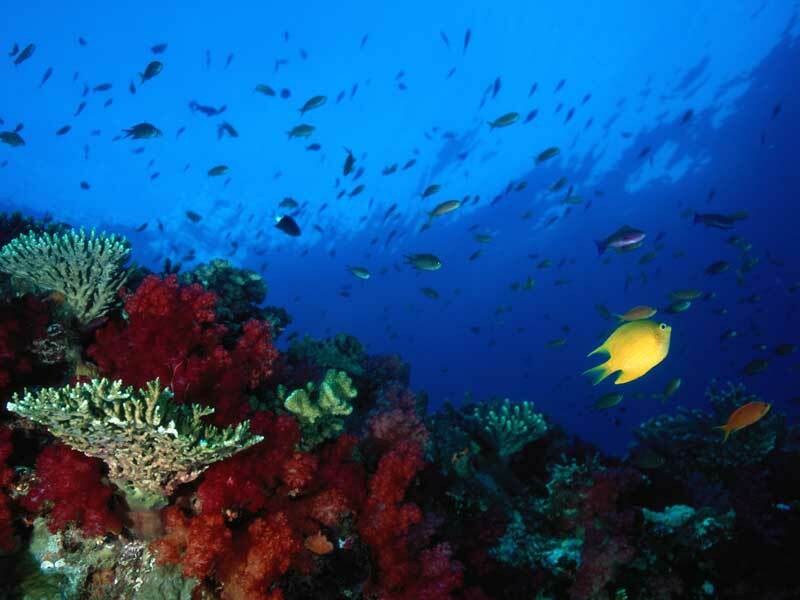 In addition to the beautiful coral, there are often multitudes of fish, and even an occasional reef shark. Set off in one of the Dive Center’s ocean kayaks and discover the beautiful beaches of Korolevu, or follow the coastline past Fijian villages, river inlets and occasional mangroves. Take a packed lunch, perhaps, and have a picnic. Don’t forget to take your snorkelling gear to enjoy the nearby reefs. No visit to Taveuni is complete without visiting the 180th meridian, the International Dateline. Taveuni is one of the very few land masses in the world that the meridian crosses and you are just a few minutes away. This natural waterslide is a 20-minute walk north of the resort. Surrounded by rainforest, it is a secluded and picturesque spot and is sometimes filled with the laughter of the local children. Easy to find, we’ll provide you with a small map to guide you on your way. The lovely old Catholic mission at Wairiki is 25-minute walk away. The mission is set into the hillside and overlooks the site where Taveuni warriors turned back thousands of Tongans in a battle which was fought in canoes just off the beach. This battle was of historical significance in the history of Fiji, for Tonga was gaining control of the rest of the country through a series of undefeated battles. The Taveuni warriors therefore saved Fiji from the Tongans … they then celebrated by cooking the Tongans in a lovo and eating them with breadfruit! The French Missionary priest who advised the Taveuni warriors on fighting strategy was rewarded for his help by the grateful people of Taveuni by the building of the large mission. If you visit the Mission on a Sunday morning you will hear the wonderful singing of the Fijian villagers. It has been claimed that the island of Taveuni is host to nearly all the bird species to be found in Fiji. In particular, Des Voeux Peak at dawn is the place to be if you are a keen birdwatcher. Professor Allen Keast and Mr. David Bishop, both respected in the field of birdwatching, describe the experience here as one of their most memorable. In particular, you may catch sight of the orange dove and the silktail, to be found nowhere else in the world. Qeleni also provides excellent birdwatching opportunities, although it takes a very early start to get there for the dawn chorus – the best bird-watching time of the day! Here birds are quite easy to spot, and a local guide can take you to the specific areas for each type of bird. A good time of year is August to September when the birds are nesting. Parrots, orange doves, silktails and fantails inhabit this area. Taveuni Estates is a large privately owned freehold development is situated about 25 minutes south of the hotel. The Estates maintains a beautiful 9-hole golf course, tennis courts (both asphalt and grass) and a lawn bowling green. These areas are open to the public and equipment is available for hire at the recently renovated Club House. It is possible to drive through the Estates and enjoy the spectacular vista from the high elevation. At dusk, you can often hear a variety of bird calls at the top of the road. Enjoy trail riding through the beautiful Taveuni plantations and rain forests with a journey which starts at Vatuwiri Resort at the southern end of Taveuni. A guide will lead you on a breathtaking ride enabling you to view this wonderful island from a different perspective. This fun experience is suitable for beginners as well as the more experienced. Tavenui is Fiji’s third largest island and located just over 200km north east of Fiji. The most direct route is via plane from Nadi (approx 90 min flight). Fly into Nadi and we can arrange a taxi/shuttle/boat transfer to the resort. Everyone is well looked after in Fiji. Taveuni accommodation is no exception with Oceanfront bures, tropical garden cottages and holiday homes catering to all budgets and vacation interests.